Posted on January 27, 2017 by Matthew Leib. This entry was posted in Spotlight, Staff Stories. Bookmark the permalink. Most mornings, Arien Cherones wakes up at 4 a.m. But you won’t find the IT director for UW Medicine’s Department of Orthopaedics & Sports Medicine complaining. Far from it. Cherones’ early hours mirror those of his department’s doctors. As IT director, he manages a team of three full-time staff who work to support them. A primary function of his work, he says, is to serve as a bridge between most of the different IT departments at the UW, Harborview Medical Center, Children’s Hospital, Northwest Hospital, and the VA. That is, when he’s not teleconferencing live case discussions from clinics in Indonesia, on the sidelines of athletic events, or plummeting from the edge of space in a zero gravity free-fall. Cherones says it’s the range of opportunities and interactions his role affords him that keeps him so invigorated on a daily basis. Doctors in his department cover the gamut of athletics at the UW, working with teams and individual athletes in addition to practicing family and rehab medicine. Orthopaedic surgeons can be some of the busiest at Harborview, Cherones says, and, as such, may not always be able to express their technical woe in a technical way. It’s a mantra Cherones has taken to heart. 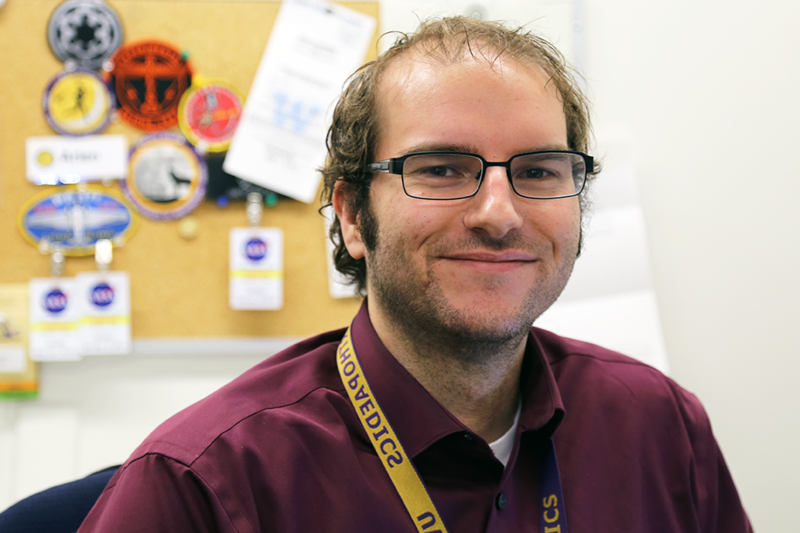 In his free time, he helps design apps for the department’s residents and faculty. He recently developed eMTRCS, or Electronic Milestone Tracking and Reporting Competency System, a mobile digital platform that facilitates real-time resident feedback by providing seamless tracking of milestones and data analytics for newly required federal standards. Cherones is currently developing another review app to more easily and accurately help the department chair give evaluations. He says he especially enjoys working with the Residency Program, waking up the first Monday of the month to help them with their computers. “Even though it’s not part of our job, we should at least look at their machines and make sure they have encryption, passwords, firewalls,” he says. He’s even been published in conjunction with a resident in the Journal of Elbow and Shoulder Surgery, having used a Microsoft Kinect to measure patients’ range of shoulder motion before or after surgery. It’s safe to say, if it involves technology, Cherones has your back. Even during a total free-fall. Literally. Over the course of three years, he logged over 560 flight parabolas of zero gravity experimentation as part of a study conducted by a Computational Robotics & Experimental Biomechanics (C.O.R.E.) lab team headed by Dr. Peter Cavanagh. The research analyzes exercise and the prevention of bone loss in space. The zero-gravity conditions on the flights, which top out between 25,000 and 30,000 feet, can last anywhere from 1 to 30 seconds, during which the team had people running on the treadmills. Cherones, who describes the airborne treadmill activity as “little sprints,” was charged with setting up and monitoring all laptops and tracking equipment for the experiment, ensuring it would all function properly under the effects of weightlessness and extreme deceleration. It’s just all in a day’s work for a man who got his start fixing Macintosh computers at Portland Community College. Working in a computer lab and studying communications, he was soon promoted to lab manager. His work, he says, consisted of re-imaging computers, the process of reformatting and repairing hard drives. Largely self-taught, the communications major was soon Apple certified, but also working to fix other types of PCs. After graduating, he moved to Vancouver, Washington where he worked providing desktop and server support for the city’s school district. In the process, he also learned how to program heating, ventilation, air conditioning, and telephone systems. The range of experiences he’s been afforded since coming to the UW ten years ago—working as a systems administrator in Pediatrics before joining Orthopaedics and Sports Medicine in 2011—is part of why he loves working in education, rather than deploying his skillset at any of Seattle’s tech companies. But does he ever stop? Cherones’ hobbies include taking photographs on the sidelines of Husky football games and otherwise documenting the work of his departments’ doctors across the University for a department website that receives over 350,000 unique visitors a month. Cherones admits to having 500-plus hours of vacation banked up, but insists he is finally using them to good end. He got married in early January and has been honeymooning in Australia. He met his wife Sarah when she began working as a student assistant in the department before being hired as a full-time administrative assistant. For their first date, they went to a hockey game—one of Cherone’s passions that is not in some way an outgrowth of his work at the UW. The couple carpool in to work on days when he’s not coming in for a 5 a.m. meeting. For all the department relies on him, his colleagues are urging him to do the same—at least for these next newly-wedded weeks abroad. Cherones pauses. About him hangs an air of dash and defiance. Even with gravity at normal levels, he seems to float on a cloud of elated energy. A roguish grin steals across his face, lighting up an already sun-drenched conference room on the tenth floor of the UWMC.